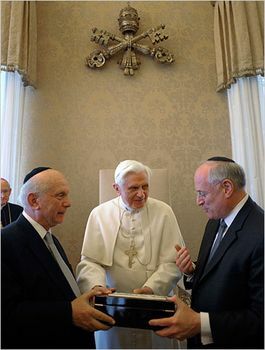 "Shoah Was a Crime Against God and Against Humanity"
VATICAN CITY (Zenit.org).- Here is the address Benedict XVI gave upon receiving in audience members of a delegation of the Conference of Presidents of Major American Jewish Organizations on Feb. 12, 2009. The two-thousand-year history of the relationship between Judaism and the Church has passed through many different phases, some of them painful to recall. Now that we are able to meet in a spirit of reconciliation, we must not allow past difficulties to hold us back from extending to one another the hand of friendship. Indeed, what family is there that has not been troubled by tensions of one kind or another? The Second Vatican Council’s Declaration "Nostra Aetate" marked a milestone in the journey towards reconciliation, and clearly outlined the principles that have governed the Church’s approach to Christian-Jewish relations ever since. The Church is profoundly and irrevocably committed to reject all anti-Semitism and to continue to build good and lasting relations between our two communities. If there is one particular image which encapsulates this commitment, it is the moment when my beloved predecessor Pope John Paul II stood at the Western Wall in Jerusalem, pleading for God’s forgiveness after all the injustice that the Jewish people have had to suffer. I now make his prayer my own: "God of our fathers, you chose Abraham and his descendants to bring your Name to the Nations: we are deeply saddened by the behaviour of those who in the course of history have caused these children of yours to suffer, and asking your forgiveness we wish to commit ourselves to genuine brotherhood with the people of the Covenant" (26 March 2000). This terrible chapter in our history must never be forgotten. Remembrance -- it is rightly said -- is memoria futuri, a warning to us for the future, and a summons to strive for reconciliation. To remember is to do everything in our power to prevent any recurrence of such a catastrophe within the human family by building bridges of lasting friendship. It is my fervent prayer that the memory of this appalling crime will strengthen our determination to heal the wounds that for too long have sullied relations between Christians and Jews. It is my heartfelt desire that the friendship we now enjoy will grow ever stronger, so that the Church’s irrevocable commitment to respectful and harmonious relations with the people of the Covenant will bear fruit in abundance.